This article originally appeared in Word & Film on December 11, 2015 by Kristin Fritz. Dr. Baird, born in Texas and educated at Harvard, began his career ascent in the 1920s in the field of medicine. Over time, he grew more and more interested in the cause of manic depression. Remember, of course, that this was the 1920s and 1930s – an exciting and terrifying time in the world of medicine, and certainly not a time when depression was well researched or understood. Indeed, Dr. Baird was ahead of his time. And sadly, he was also a victim of the disease that so fascinated him. As a child, Mimi Baird didn’t fully know her father. He was most often absent, in and out of institutions, and ultimately stripped of his medical license. Dr. Baird met his fate following a lobotomy. Fifty years later, Mimi set out to understand her father and to share his story and to bring to light his achievements. 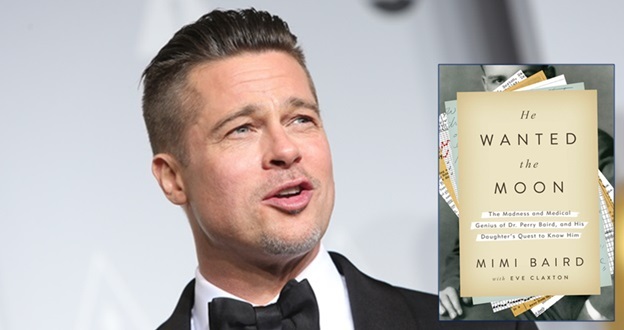 Actor/director/producer Brad Pitt has in recent years attached himself to projects that help unearth incredible stories that haven’t received much fanfare. See: “12 Years a Slave” and “Moneyball,” for example. “He Wanted the Moon” will be an exceptional addition to his canon. We can’t wait to see it all unfold.